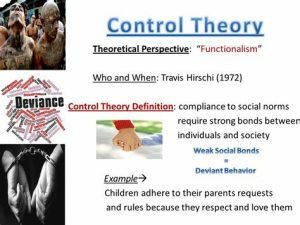 Control theory is a school of thought that has been used in the field of criminology for the better part of a century. This theory is based on the idea that conformity cannot be taken for granted, thus crime and delinquency that occurs within an area or community, should be expected if social controls are not implemented. A few important points are to be made here, especially when we are speaking of American society. America was founded on individual responsibility, and we have God given rights that are recognized in our Constitution, as we have always looked to limit the power of the government when it comes to giving Americans the freedom to live their lives. On the opposite side of this coin, you do have the need for the rule of law, and there must be order. The founding fathers tried to create a government that operated in the realm of what they eventually referred to as people’s law. This falls right in the center between a totalitarian state and total anarchy. It was an attempt to create a balance that encourages a sense of liberty but does not allow a free for all. There is a case to be made regarding social controls in the form of criminal law. Even today we are attempting to find that sweet spot when dealing with the power of the police state to deliver justice in the right circumstances.